Editor-in-Chief Dr. Gerald Seals, Professor of Business, Newberry College, USA. 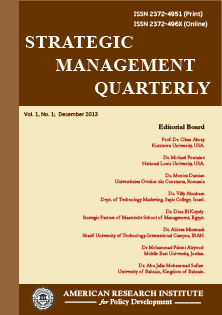 Strategic Management Quarterly is a peer reviewed international academic journal that publishes original materials concerned with all aspects of strategic management. The journal publishes the research papers devoted to the improvement and further development of the theory and practice of strategic management. The journal provides a communication forum for advancing strategic management theory and practice. The Journal seeks to improving the existing knowledge and understanding of strategy development and implementation globally in private and public organizations. Strategic Management Quarterly is intended for researchers, faculty and other academics involved in the growing field of strategy as practice that embraces emerging academics and international ideas. Papers accepted for publication are double-blind refereed to ensure academic integrity. Practicing managers will also find this content of value when formulating and implementing new strategic initiatives, particularly the consultant market. Each paper published in Strategic Management Quarterly is assigned a DOI®number, which appears beneath the author's affiliation in the published paper. Click HERE to know what is DOI (Digital Object Identifier)? Click HERE to retrieve Digital Object Identifiers (DOIs) for journal articles, books, and chapters. Dr. Gerald Seals, Professor of Business, Newberry College, USA. Prof. Dr. Okan Akcay, Department of Business Administration, Kutztown University, USA. Dr. Vedat Akman, Department of Business Administration, Beykent University, Turkey. Prof. JulioAraujo Carneiro da Cunha, Dept. of Business Management, Paulista University, Brazil. Prof. Maria Rosário Justino, Dept. of Management, ISCAL- Polytechnical Institute of Lisbon, Portugal. Prof. Dr. Abdulnaser Nour, Middle East University, Amman – Jordan. Dr. Oktay EMIR, Anadolu University, Eskisehir-TURKEY. Dr. Hengky Sumisto Halim, Universiti Utara Malaysia, Kedah, Malaysia. Dr. Qadir Mohiuddin, PhD, NYIT- New York Institute of Technology, China.